Im doing this as my project too! i have this math project and it is about the golden ratio. I have to analyse celebrity faces and figure out what is their golden ratio then we have figure out which celebrity is closest to THE golden ratio. We also have to write a documentary about it and create a survey its due to tomorrow and i have not even started. PLEASE HELP ! I do not get my math project any suggestions on how to do it would be the most amazing thing at this moment. PLEASE HELP ! You’ve at least come to a good place to get started. See the articles at https://www.goldennumber.net/category/face-beauty/, and also the research of Dr. Stephen Marquardt at http://www.beautyanalysis.com. Many thanks! My daughter will find this very helpful. i am doing a maths project too!!! i am doing maths too!!! I would submit the Phi symbol is perfect as a symbol of 0 intersected by 1 graphically and perfectly represents not division but the subquantum immanence or (un)presence of a metaphysical Unity, the Biblical I AM, where nothing, but everything, (un)resides …. what the physicist might refer to as the wave function with particle potential ..
I’ve had very similar thoughts, as expressed on the Theology page. wave function is simply a tool to estimate a particle location not a universal property, same as super position and Schrodinger’s cat, the cat can not physically be dead and alive, we simply don’t have enough information for out tool, classic example of someone overthinking things, the observer does not affect the observed. tree falling in the woods anybody? Do I understand this comment? I don’t think I do, please explain. March 8, 2013 Corel Painter X … as you likely know has ‘Divine Proportion’ available as a guide for rendering file compositions. I first learned about ‘Golden Section’ from one of my art teachers, Mr. Flury at Art Center College of Design in Pasadena, CA. He had been on the staff at Disney Studios back with Walt, and was the archetype model inspiration for their cartoon animation character, Jiminy Cricket. wow! for some reason i was late for church. p/u the kid section of the comics and saw the golden ratio. Just like the ratio, divine insperation led me here. Just as the square and the equilateral triangles give us two special right triangles, the pentagram gives us two more special right triangles resulting from two unique isosceles triangles found within the pentagram itself. I’d like newsletter or alerts to new findings of .618 or 1.618 in the world. If phi is in most of life, it must be important. I can help in research for u if u ever need it for a publication. I am a money manager and I use phi in my work. I think Phi is simply irrational. Yes it is. It is an irrational number of a unique nature.. with its recurring decimals both in truth and in nature. Interesting article. I wonder why it is not better taught in school. Then again, it is irregular, keeps on cropping up in life and seems to balance at this point. so 1+square root of 5 divided by 2 equals 1.61803339…. But 1000 divided by 618 equals 1.6181229…. 1.618 and 0.618 are just rounded values used for simplicity when discussing the golden ratio. If you want more accuracy you must use more decimal places, e.g. 1.6180339887, or its actual value, e.g., the (square root of 5 + 1) / 2. Very interesting, thank you! Do you know if and how Sacred Geometry can be used in hands-on healing? Nice! Thanks for the information! For GODLY Design of Makkah (The Mother of all cities) as the ABSOLUTE REFERENCE POINT on earth please see the link above. I m working on my architectures design so that the building luks in d golden proportion frm each elevation… Thanx loads fuh d deap info!! 20 years ago I completed my Strathclyde University Degree dissertation based on the Golden ratio. In it, I had to prove that it did exist. In doing so, I subjected many of my friends, family and colleagues to questions relating to the Golden ratio. I used a simple piece of paper with a black dot marked at various places on the sheet. The sheets were A4 (UK) in size which, as you will know, use the Golden ratio for their paper size (A3 is double A4, etc, etc). The results were interesting. The engineers that I questioned predominantly felt that the ‘dot was most pleasing to the eye’ when shown at the exact centre of the page. The artists varied. Most other people (who generally did not think too deeply about art, measurements, science, etc) found that the ‘most pleasing place on the page where the dot was placed’ located it at the Golden ratio point. There were approx 150 people who were subjected to my questionning. The research was subsequently used by Nestle to identify where to align their corporate names on food/sweet wrappers for maximum effect. Unfortunately, I have never been able to get hold of my work and did not keep a copy. I will track down a copy one day when I visit Scotland. Thanks for reading. The paper sizes are silver ratio not golden. They are called root 2 rectangles. There’s no reason to believe that the golden ratio can be used to pick lottery numbers, or any other method for that matter. Lottery numbers are selected by a process that produces RANDOM results, and that means they cannot be predicted. You can use it to pick lottery numbers. It just won’t work. Dr. Peter Mandel’s Esogetic Medicine utillizes Kepler’s information and many others to treat patients with color therapy. This therapy is similar to acupuncture and it utilizes colors. It is transmitted through the skin and doesn’t puncture it. He utillizes alignment with the center of the pupil for many treatments. Throughout the body, there is proportionality in every treatment. This is just one possible synchronicity in healing modalities. It is also common for traders. I personally use Fibonacci for my trades and it help me to get successful trades. Gary, great to find a phi guy online. Writing to invite you to view the fine-tuned phi finds in ancient monument geodetic geometry, including Qin’s tomb and major American monuments, Newark, Pachacamac, Chavin, Tiwanaku, Tula, Chichen, and Machu Picchu (ArchaeoBlog link above). Perhaps you’ll have some insight to further understandings of what this conveys across time. I have a page on the Great Pyramid at Giza on this at https://www.goldennumber.net/phi-pi-great-pyramid-egypt/, but do not have anything else on dimensions related to the golden ratio. There seems to be a clear connection between all these structures, some of which seem to be in alignment across the globe. If you come across any golden ratios in their proportions or positions I’d love to hear about it. You may find my software at http://www.phimatrix.com to be helpful in the analysis. I recently published a paper for Nexus Network Journal confirming the design of Khufu’s pyramid was indeed in golden ratio proportions (arguing Markowsky’s contention it was a misconception) supported by the fact that it was in the same proportions as the figure in ancient Egyptian art. ( Vol 16, No 2, 2014). I have also discovered a meta-golden ratio rectangle (I use ‘chi’ for its symbol). we know that if one removes a square from the end of golden ratio rectangle one is left with another phi rectangle. 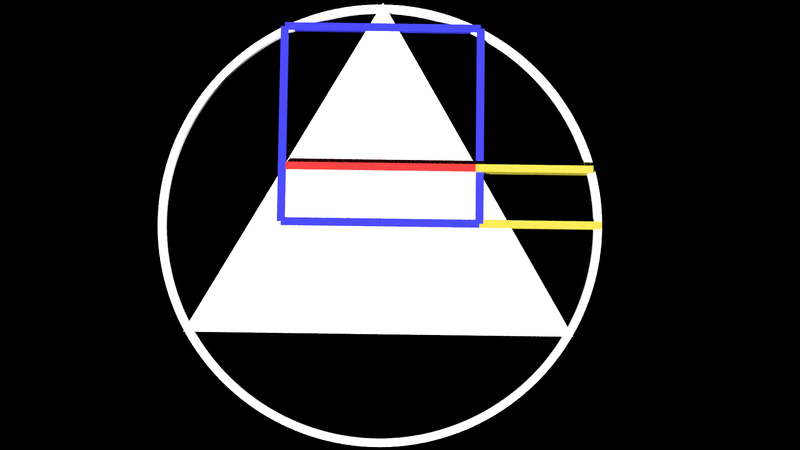 Whereas, the unique feature of a meta-golden chi rectangle is that if one removes a golden ratio rectangle from one end the remaining rectangle is another chi rectangle. Golden numbers are amazing. I found in 11×11 Pascal’s Triangle there are 11 sub-triangles that connect to each other and whose the sum of their numbers is a prime number and also there are also 11 fibonacci numbers inside that 11×11 P’s triangle! I haven’t tried it to higher nxn pascal’s triangle but i bet there must be other interesting pattern that connects Prime numbers and fibonacci numbers. let’s take the application of Phi in beauty, thinking about this ratio being a constant number would mean beautiful things or faces would have the same consistency in design so as to achieve this constant, ultimately it would mean designing a perfectly beautiful subject would ultimately have a definite shape, which could never be altered in anyway, say for example, we want to design a human face from clay that actually embodies Phi, this would mean the nose would take a certain shape, so would other parts and sections of the face ultimately the face would have a definite shape which could never be changed in way if we dont want to temper with the constant. however, this is not the case in many of the actual faces we regard as beautiful in the sense that they are not actually the same, to some extent i could even say from just a thought that some of the beautiful face do not maintain the constant. No project just an odd dream. I was trying to put together a golden key inside a tablet but I had to follow the fibonacci sequence. I didn’t know it. So I woke up trying to learn more about this golden ratio. Thank you so much you’re website is really informative and very well written! Well I know understand how to work out golden ratio “the basics is enought for now and I now know how fibonacci sequence works! Thanks a dozen Mr. Meisner!! Does golden ratio have any impact on the subject of geometry? Yes. See my entire section devoted to geometry at https://www.goldennumber.net/category/geometry/. Johannes Kepler, who discovered the true nature of orbits of bodies in space as ellipses, said this: “Geometry has two great treasures; one is the Theorem of Pythagoras; the other, the division of a line into extreme and mean ratio. The first we may compare to a measure of gold; the second we may name a precious jewel.” The “division of a line into extreme and mean ratio” is the description of the golden ratio that came from the writings of Euclid in ancient Greece. The articles use 1.618 because that is Phi, both by definition and by mathematics. The only positive solution to the formula that is used to calculate Phi is 1.618. See https://www.goldennumber.net/math/ for details. it really helped me in my project and i didn’t had to go on other sites as everything that i wanted was given here so precisely. all the content was as per my expectations and factually correct. Thank you, Pratham, for your note of appreciation. I’ve tried for years to make this the best site on the web on this topic and sincerely appreciate your note. Hi, I find the whole subject fascinating but have one simple question – what makes this ratio so attractive, so appealing in so many forms. Yes it may explain why a face appears beautiful or why a building appears marvelous in terms of proportion, but what is happening in our brain to make this ratio so appealing and satisfactory. No one I have seen has ever explained this. This, however, does not explain why the golden ratio appears more attractive as a dividing point, say in the distance of the lips between the eyes and chin. There is something more at work here, which is likely hard-wired into our perceptions of beauty. I got it as close as i could get it with 3ds max… Still don’t know if I’m not seeing something right lol. The higher Golden Ratio Bar is a bit shorter then the one associated with the square in the middle. I used the corners of the higher bar rather then the middle of each rectangle. The render angle and depth of the higher bar allows it to make it look more correct. It took a long time. But I wanted to see if I could do it. This is an accurate rendering of the two Phis… Triangle inscribed in a circle drawing. Well you did not find this number in the Bible but you can find it in the Quran’s chapter 3 Ayat 96 about Mecca.